At MSS we supply high quality rubber products that are used in a wide variety of applications throughout the Quarrying and Mining industries, all of which meet the specific needs of the project and, in the process, challenged the boundaries of rubber technology. Some of the applications for our rubber products include: Rubber to metal bonding, Target backing linings, Road sweeper seals and curtains, Fabricated parts and seals, Marine lock gates, Marine dredges and barges, Tank lining and also silo linings. We supply wear resistant rubber material in red and grey along with a range of associated products. All our quality assured products are supported by a full technical service and we are happy to provide custom application quotations on request. 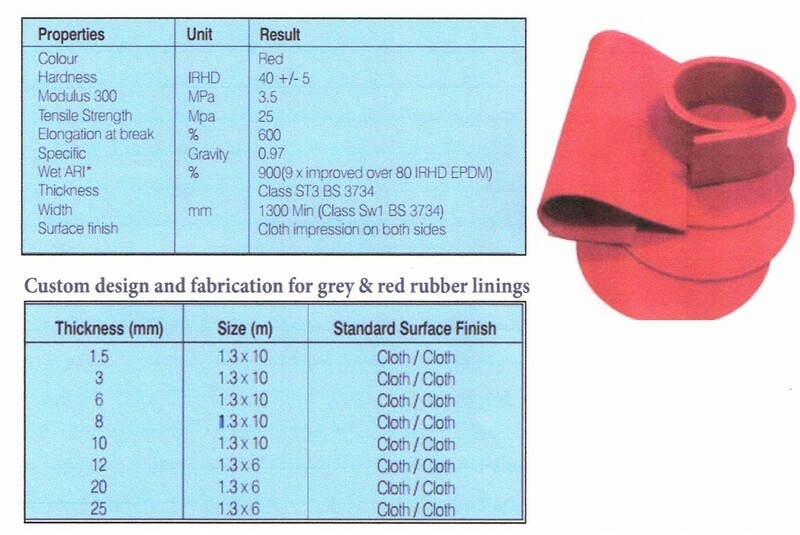 Our Red HD Rubber that we supply has been designed as the ultimate wear resistant rubber material, incorporating all the benefits of existing wear resistant lining materials, exceeding the industry standard for wet abrasion resistance and elongation at break point and featuring a surface finish which is conductive to effective bonding. Red HD is supported by a range of complimentary products, designed to make it’s application economical and trouble free. Industry standard resistance to wet and dry abrasion. Elongation at break figure of 600% – among the best available. Ability to supply rolls in lengths of up to 10m. Good quality bond achievable on site with our adhesives. Our Grey HD Rubber has all the characteristics of the original Red HD Rubber, with the additional benefits of a heightened resistance to ozone. The main weaknesses of wear resistant materials is their tendency to crack when exposed to ozone. Recognizing this, We can supply an alternative material, which has heightened resistance to ozone. Coloured grey for easy identification, Grey HD is a superior material to all those already available on the market. This rubber is also supported by a range of complimentary products, designed to make its application economical and trouble free. High resistance to ozone cracking – at least 5 times higher than most other lining materials. Grey HD can be supplied pre-bonded to a variety of metal substrates. Each of these products have been specially formulated to work specifically with our own lining materials.